so my boys have been begging for jedi robes. last week while i was tired and probably half asleep boy #1 had a conversation with me that i can't remember for the life of me what was said in it, but at the end i did the "pinky promise" to seal the deal. oh crap what the...what had i just promise to? apparently i pinky promised that by the end of the week i would have made and outfitted all three male noisemakers under the age of 11 with a jedi robes. i've been working on a lot of other things. yes i have. and yes it's been rather quiet on the V and Co tutorial front...but there is a reason. in due time, made known to you, it will. but for now here's what i've worked on this week. three jedi robes for the boys...and one jedi robe for the girl...only because the first jedi robe for the third noise maker was too small. so she got it and wore out in town. she loves it and calls it her "sen-sen rofe" which translates out to "princess robe" because hello princess leah and hello padme before she's made queen or after or... whatever...i'm not the nerd in the house. and so here it is the first ever "link me up" post i've ever done. whether it's a V and Co tutorial or not. show it you will! okay sorry with all the yoda talk. have a sweet weekend. come monday i have one of the things i've been working on to show you. Okay, I am the dork that put my name instead of the name of my project, is there a way to change it? Great robes, by the way. My boys are on a total star wars high and would love them! I love the robes. I have a couple starwars geeks too. My brother sent me a link to Clone Wars cartoons from 2003 yesterday and they are bouncing off the walls over it. "If we're going to have a Jedi Council at all, then somebody, somewhere, is going to do what it tells them!" Looks like you've been at the beck and call of the Jedi council!!. cute little jedis, they are. I wish I had something more exciting to share today. I have some cool WIPs, but need to finish them. The jedi robes are awesome!! My kids are totally into dressing up too and we have a million costumes that are constantly strewn all over the place. I like it though because it helps them be creative and play together. Did you use a pattern for the robes? Thanks for giving me a place to show off my quilt- I love it!! I am about to finish my 9-patch quilt top. It is adorable! Thanks for all the great tutorials. And don't worry about not posting a lot of tutorials lately, I probably need a year to catch up with making all of your patterns/tutorials that I already have!! I'm excited to see what you're working on. Let me guess- a moda fabric line? A book? If you publish a book I will be first in line to order it on Amazon!! They look fantastic. Great job, I have to quickly close this post before my two come along and order one each!! I can't wait to visit the links you have here. Thanks for hosting such a fun party. Ps. Can't wait to see what you have up your sleeve to show all of us! Stephany--I did that too! You can delete it, there should be a small red X and relink! And um, can you show us how you made the robes? I have a four year old youngling that would DIE for one!! Love love love the Jedi robes Vanessa! I'm sure the boys (and Katie) are very happy and hey, look at it this way, not you won't have to listen to them constantly ask for them anymore! The link up idea is very cool and I just added my first tutorial (which I wrote last week) to it! Off to check out everyone else's links now! Please please please tell us how to make these. Even simple instructions would be ok. I tried making one years ago and failed so miserably that I haven't tried again. My 4 siblings and I used to do that to my mom when we were kids! She was the worst when she was asleep...eventually she started a new family rule "No asking mom questions unless she is in an upright position" It was a hoot and quite the joke in our house for...well it still is...when she set that rule even though we all knew the sleepy pinky swears were over for good. I must admit though, we did get our fair share of things out of her before she figured it out and put a stop to it! The Jedi outfits are too cute! Great job! Ha! My little boy walked in right when your blog came up and yelled, "oh wow, can we go to their house!?!" U made a special memory for them, they will TREASURE those robes. Be proud u will (eh, I tried to speak Yoda). My boys have those too! LOVE all your creations, ideas, & projects. You are one talented lady! Thanks for the "link" post. It's amazing how Star Wars has persevered! My boys (14 & 16 yrs old) would have loved the Jedi robes! Very nice job you have done!! Where is a picture of you sweet daughter in her new princess robe? All those great blogs to look at...that will keep me out of trouble over this Easter weekend. But, I am sure I will feast on my "lions share" of candy. Have a nice weekend and fun with the kids and hubby. Those robes are so cool! Hubby and my son would LOVE those!!! DId you use your own pattern or something online? I would love to learn how to make those. They are so cute in them. Awesome robes - I have 2 boys around here who would love those. 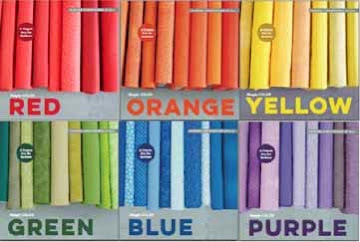 I know others have inquired as well, but please share your pattern source. Don't say you just winged it either or I'll have to seriously hate you. The kids look adorable in their costumes. I'm not a nerd, either, so I have no idea what it all means, but they're still adorable! It's so sweet of you to do a link up! Have a wonderful weekend with your family and have a Happy Easter! Cute robes friend. So now you have a linky party all your own. Where is your linky tag? You know I will slap that sucker on my blog. For now I linked up and joined the fabulousness. really really love the new layout of your blog. It seems more user friendly and pops up quicker on my computer! yay! Loving the new layout! Looks fabulous! Love your Jedi robes, I do!! Check the links , I will do!! OmGosh! My three boys would be over the moon to get Jedi robes...they have tucked the lightsabres away lately and turned to stick fights in the spring weather outside thank goodness. It never ends well with a swooshing, slappy plastic wand. 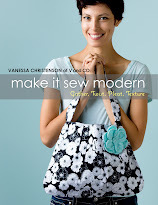 Love your site, a friend passed it along as we have similar taste, wish I had your gift for sewing. I will come here to swoon when I feel like doing something with my stash of fabrics. I tried to link but being the big computer nerd I am it's a photo of me instead of my stacking dolls craft. Yikes. 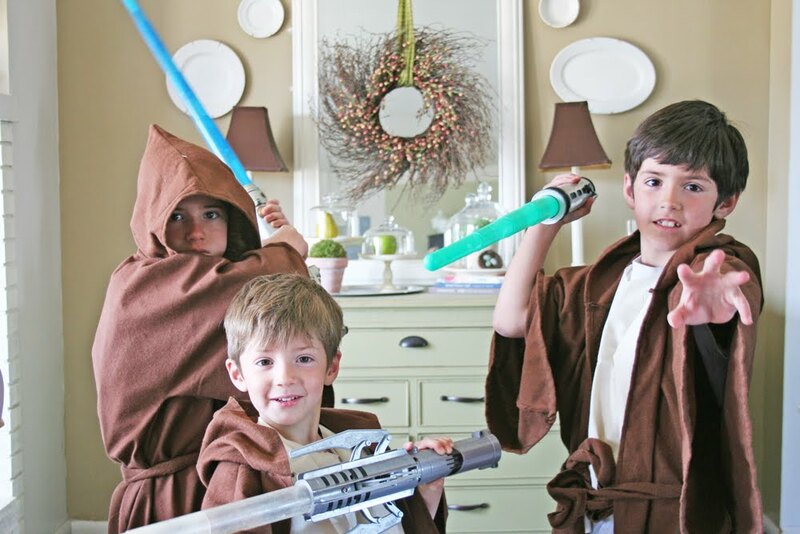 Oh, my 3 boys (under the age of 11) have seen your post and are jumping, begging, me to make them Jedi Robes. They also have a little sister that could use a princess robe! Would ABSOLUTELY LOVE a tutorial for these!! !